Jaded Blossom: Mother's Day Set! Mother's Day is this Sunday! Do you need a card and treat bag idea? 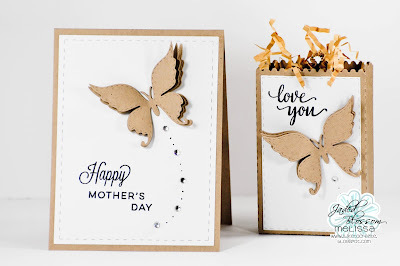 This is Melissa from M Miranda Creations and I have a set to share with you today! I love the simplicity of kraft colored cardstock, but I still wanted something that shouted spring and love and gratitude to my mom all at the same time. I think this gift combo did all of that. But if you want to add some color to this, that would be so easy to do! I love the simplicity & beauty of this project.